This professional training is for therapists or MD's working with clients who 'hear voices'. This problem affects about 15% of the general population who are otherwise completely normal, as well as clients who also have various mental disorders, most notably schizophrenia. 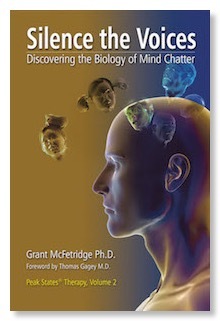 The technique also works for people who don't hear voices, but wish to eliminate their background 'mind chatter'. This includes people who have 'intrusive' or 'obsessive' thoughts, as well as people who simply want to have a silent mind, such as meditators. For detailed descriptions of this approach and client reactions to it, see our 'Hearing Voices' clinic webpage, the video at the bottom of this page, as well as our textbook, Silence the Voices. The most common type of 'voices' is indirectly causes by a subcellular fungal infection. Our Silent Mind Technique™ has two treatment approaches: one that eliminates an individual 'voice' in minutes; and one that uses a neuro-immunology process to eliminate the underlying fungal infection. This latter approach takes between 2 and 9 hours to permanently eliminate all the voice symptoms in the typical client. Note that the current process (Silent Mind Technique rev 2.3) only eliminates 'ribosomal voices' caused by the fungal infection. Fortunately, other types of voices are far more rare; we hope to introduce treatments for them in 2018. This class is designed for therapy professionals who are already working in the field of mental illness, as well as therapists who intend to use this technique with their non-schizophrenic clients. Lay people can attend the course with instructor permission. Currently, this class requires an adequate background in trauma therapy. This can be done via course #120, or via other training in this field (with the instructor's agreement). You agree to keep updated as the techniques improve. You agree not to teach the material you learn. This is because of safety issues with the very powerful processes being used, and because of intellectual property rights issues. To maintain our ethical standards, you agree to give clients a brochure that explains the nature of the process, safety procedures and other information. You agree to a code of ethical conduct, found on this website (www.peakstates.com/ethics.html). The Schizophrenia Project at www.PeakStates.com. Hearing Voices treatment at www.PeakStatesClinics.com. The Hearing Voices Network at www.hearing-voices.org. 1.0 July 5, 2007: Initial description of this course.